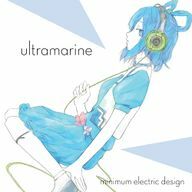 ultramarine is a doujin album by minimum electric design released on 2013-5-26 (Reitaisai 10). It features vocal and instrumental arrangements of themes from Embodiment of Scarlet Devil, Imperishable Night and Ten Desires. The album is largely instrumental with only tracks 2 and 3 having traditional vocals, track 8 being an ambient rearrangement of a vocal track. Track 8 is an arrangement of リピート from the cosmic recognition. This page was last edited on 24 April 2017, at 17:09.